If you think Dubai is for the luxury travelers looking for relaxation in spas and resorts and spending cash in malls, well you are not wrong entirely. Dubai is famous for all these activities, but what are soon climbing up in the popularity charts are the adventurous activities that can be done in Dubai. It is no more a place just for the laid backs; Dubai is now a happening hot spot for adventurous tourists as well. Here’s a list of adventurous outdoor activities you can enjoy in Dubai. The best way to see the city of world records is by skydiving and soaking in the spectacular sight of Dubai from the sky. Taking off from Dubai Marina, jumpers jump off the plane tucked to an instructor above the Palm Jumeriah. The adrenaline rush is unbeatable and can only be experienced. 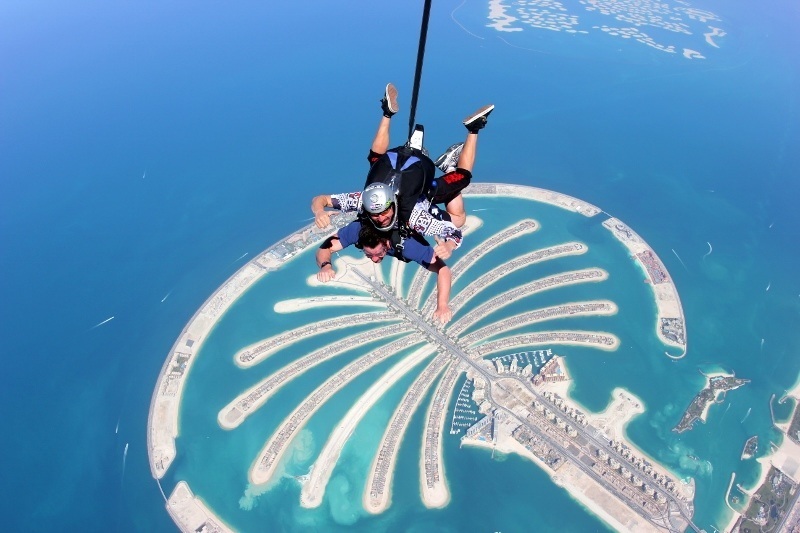 The fast heartbeats are only till the parachute opens, post that, it’s time to relax and soak in the magnificent views of Dubai up from the sky and slowly get down to the palm drop zone. However, it takes a good amount of guts to do this adventurous activity and Dubai skydiving gives a chance to do just that. Whether you are a professional skydiver or trying it for the first time, the only requirements are your will to freefall and enjoy the adrenaline rush. If you thought Dubai is only about flat sand dunes and buttery smooth road rides, wise up- mountain biking is the new adventure sport of Dubai that is attracting tourists from various parts of the globe. 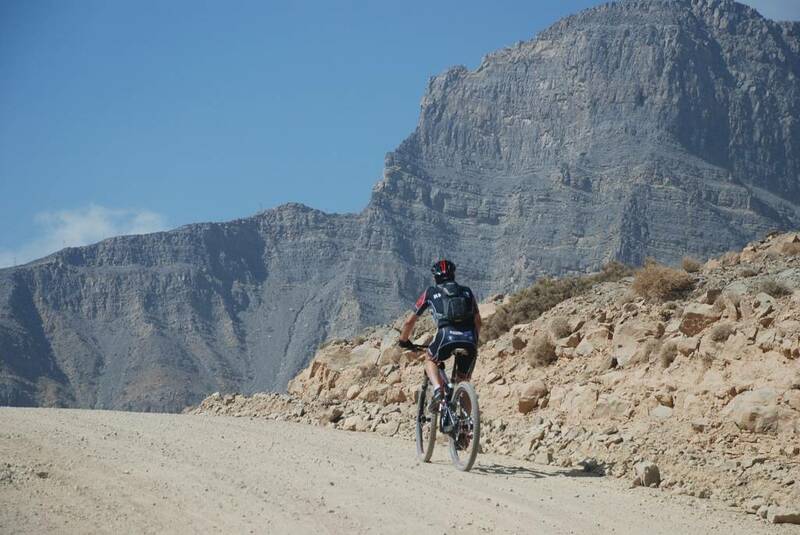 Running the east side of Dubai within the Hajar Mountains through the Oman and Ras-al-Khaimah emirate, bikers have a tough trail to tackle. There is a long stretch of approx 70kms of biking trails testing the mountain biking abilities of even expert bikers. These are no ordinary routes. The wild craggy and wrinkled terrain, narrow and steep trails animal paths that will have mountain goats, wild donkeys and will be there to accompany you. One of the famous activities of the adventurous tourists, desert camping has taken over as the latest craze in Dubai. From where the marvelous city of Dubai ends, starts the magnificent desert of Dubai. Take your camp gear and treat the massive desert if Dubai as your cam site. You can camp just about anywhere you want on the desert. If you are looking for popular camping spots, Shwaib is a good camping spot, just off the Dubai towards Hatta road after a drive of a couple of hours from Dubai. Don’t worry if you don’t have the equipment, you can still put up a good camp and enjoy desert activities. Many well-known tour operators offer overnight desert safari packages that offer camping, BBQ dinner, camel rides and other fun filled activities. Grabbing the headlines, the Red Sea of the Middle East offers great underwater experiences lesser known to the tourists. 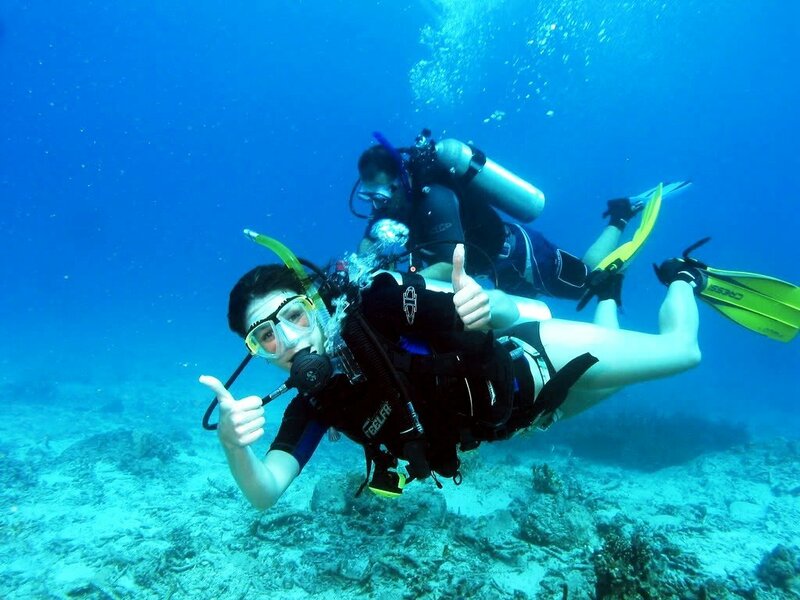 Gradually gaining popularity amongst marine life lovers, there is a host of reef and wreck diving facilities with trained instructors and state-of-art equipment to ensure the safety of the divers. While reefs are meager on the Dubai coastline, divers can easily find some good wreck a few miles off the shore. An artificial coral coated reef is formed on the 1998 sunk anchor barge and cargo ship named Mariam Express bottomed in the year 2006 makes for a good wreck diving activity. The wetland along the coast of Arabian Peninsula makes for a perfect kayaking arena. The kayaking activities can range up to half day to two days with a stay. 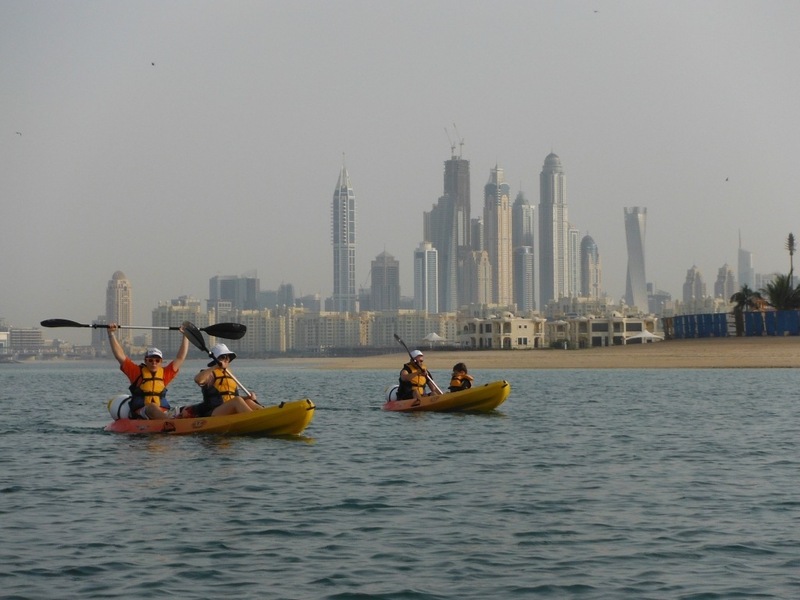 There are many companies who offer kayaking tours and allow you to explore the adventures of the Arabian Peninsula. Camping on isolated beaches, travelling around the picturesque coast of Dibba, BBQs and much more includes the sea kayaking activities. While doing kayaking, you also get to explore and watch rare species of birds and endangered species of white collared Kingfishers. Spend gliding on the calm waters of the sea and explore the waters more closely. 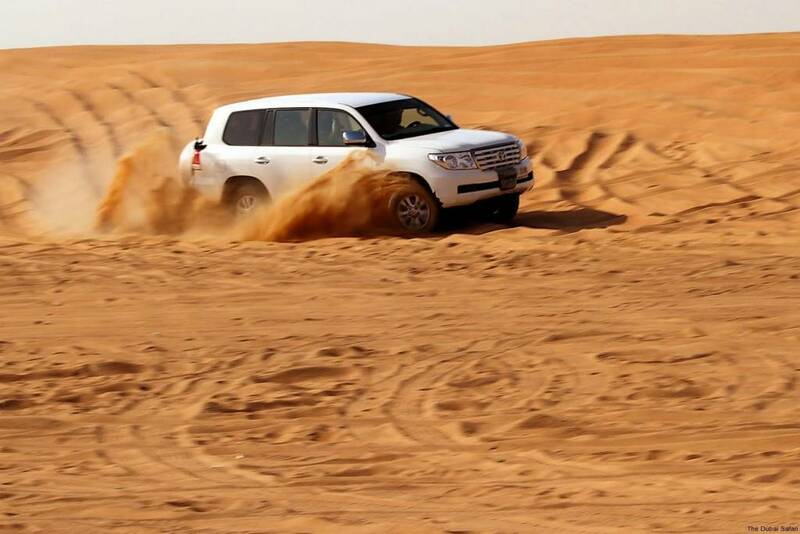 Take a stomach churning bumpy ride to sand dunes bashing and explore the wild side of adventure on the deserts of Dubai. While experienced drivers take you through the ride of your lifetime in hummers and similar vehicles, you sit tightly clenching your side grips enjoying the ride to the fullest. It is always advisable to choose a desert safari package that includes a lot more activities than just the bouncy rides. Reputed Destination Management Companies provide great packages that offer many options like Hatta mountain safari, Morning desert safari with Quad biking, Red Dune safari and a lot more options. You can select the package as per your interest based on activities and time you have in hand. A combination of dinner in desert and safari can prove to be perfect to add to your experience. Offering a range of exciting challenges, the hiking and climbing scene of Dubai has been steadily increasing. 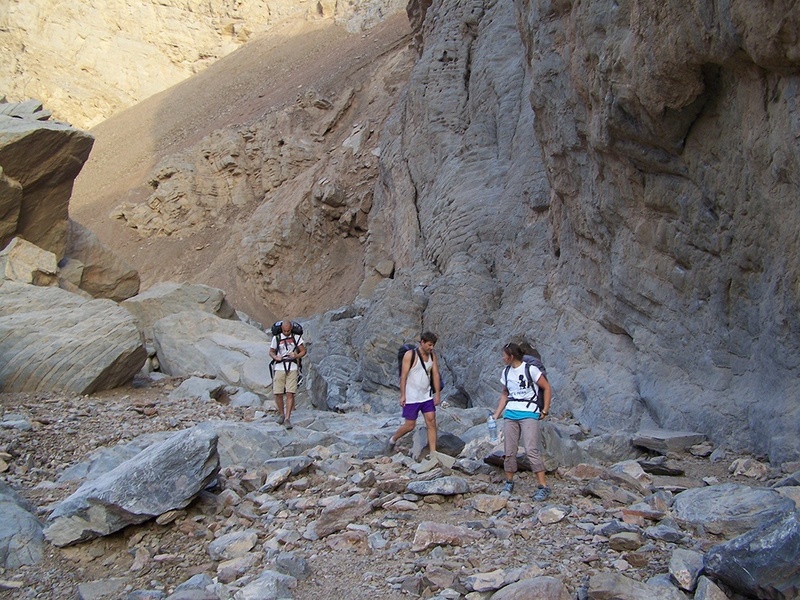 Trekkers have been regularly venturing on Hajjar Mountains (10000feet) and Jebel Misht along with many short climbing cliffs to enjoy hiking and climbing activities. Dubai offers a lot of adventure to trekking enthusiasts. Even for non-climbers and beginners, there’s a good hiking route of the Ras-al-Khaimah to explore. As you climb high above the desert to the Rocky Mountains and rugged pains, you’ll see a different side of Dubai with remote villages, wadi pools and fertile farmland. Every adventurous activity offers you a different way of looking at Dubai, a new way of exploring the diversity of Dubai. So go ahead, get a Dubai visa online and enjoy Dubai in a new daring way. Camping is a high-tech affair in the 21st Century. Here are the pieces of essential camping gear you need to bring, from basics to new gadgets. Summer trips are simply incomplete without coolers. Whether you want to chill your favorite drinks or simply want to protect your food from going stale, coolers are your best buddies on vacations. However, the selection of the perfect cooler can be hard because of the presence of many yeti options to choose from. In this article, I like to discuss some ideas for Girls Night out or ladies night in a city. What possibilities can we have? Let’s see……But the First question, What is a girls/ladies night out? Before that what is a night out first? Are you about to set off for a hiking adventure, confronted with a search for the best fitting backpack, like I was for unpredictable spring weather in the Middle East? 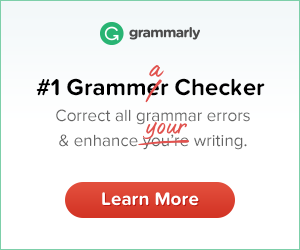 Maybe that you fall into the group of spontaneous trip undertakers and are not anyhow excited about doing an in-depth analysis of all available bids. 10 Weekend Outings with Family or Friends. What Makes Public Parks Important? Public parks serve a variety of purposes for different age groups. They give adults a social place to hang out and exercise and provide a playground for children. If I talk about my personal experience, I have spent a good amount of time in the public parks. Winter brings out the beauty in Brisbane with it's beautiful and clear sunny skies. It is the place for the entire family to have quality fun time and enjoy the sunshine in the chilly weather. If you have ever wanted to take part in desert safari Abu Dhabi is the place for you apart from giving you an opportunity to indulge in camel rides, archery, desert walk, falconry and other activities.